Written and directed by Eric Rohmer, The Bakery Girl of Monceau is the story of a law student who finds himself falling for a young woman working in a Parisian bakery as he was supposed to meet another woman. The film is the first part of a series of films relating to morality entitled Six Moral Tales as it plays into a man deciding about what to do as he is caught between two women. Starring Barbet Schroeder, Claudine Soubrier, and Michele Girardon. The Bakery Girl of Monceau is a fantastic short film from Eric Rohmer. The film revolves a law student who has been trying to get the attention of a woman he had seen pass by him as an attempt to meet her for a date has him meeting a young woman working at a bakery that he falls for. 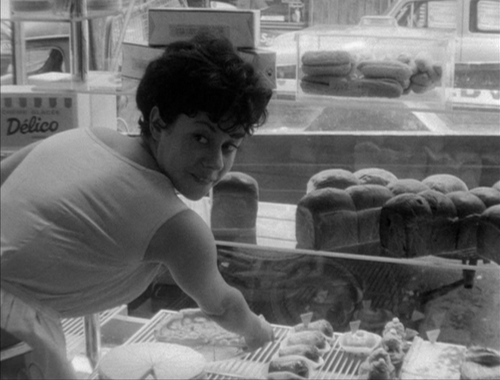 It’s a simple 23-minute short film that takes a premise of this young man (Barbet Schroeder) who is supposed to meet this woman on a date yet he keeps coming to this bakery to wait as he was hungry as he is smitten by this young woman working at a bakery named Jacqueline (Claudine Soubrier). The film is told from the man’s perspective but from a different voice that is narrated by Bertrand Tavernier which plays into this man’s thoughts and the moral implication he’s in over which girl he wants to take. Eric Rohmer’s direction is quite simple as it is shot on location in the Monceau section of Paris where Rohmer aims for that cinema verite style of shooting on exact locations with something that feels loose and real. There aren’t a lot of close-ups nor any music score to accompany the film other than what is played on location. Instead, Rohmer keeps things simple to capture a man dealing with his situation as Rohmer’s usage of medium shots and grainy 16mm film through the black-and-white photography of Bruno Barbey and Jean-Michel Meurice add something that feels free in the way Rohmer sets up scenes including the moments the man would have with Jacqueline. Co-editing with Jackie Raynal, Rohmer does bring in a sense of style through its jump-cuts as well as in some rhythmic cuts to play into the man’s dichotomy about which woman he should be with. Overall, Rohmer creates an engaging yet heartfelt film about a man who falls in love with a young woman on a day he was supposed to go out with another woman. The film’s cast includes some notable small roles from Fred Junk as the young’s man’s friend Schmidt and Michele Girardon as the woman Sylvie whom the young man was supposed to meet on their date. Claudine Soubrier is amazing as Jacqueline as this young woman who intrigues the young man as she is someone with just simple ideas about things in the world. Finally, there’s Barbet Schroeder in an excellent performance as the young man who copes with the situation he is in as he tries to make sense of what he is going through while eating numerous pastries as it’s a performance with some charm and wit as it plays into his character’s struggles. The Bakery Girl of Monceau is an exquisitely enchanting film from Eric Rohmer. It’s not just a witty short film but also one that plays into a man finding himself in the middle of a very complicated situation. In the end, The Bakery Girl of Monceau is a delightful film from Eric Rohmer. A strong short, and I was completely immersed in that world. I like the voice-over so we get to know the inner life of the main character. I've seen 4-5 Eric Rohmer films, and this is still my favorite of them. This is actually the third Rohmer film I saw along with Suzanne's Career and Pauline at the Beach as the latter was something I saw a long, long time ago.